You know you need a contract when you’re in business. Hopefully you didn’t learn the hard way about the value of contracts by making a big mistake...but honestly, most of us have. You’re working with a client who is constantly pushing the limits of what you agreed to when you started working together. Your invoices never seem to get paid on time. You know the drill. This is exactly why contracts are an essential tool for your business and one that you need in place from the very beginning. 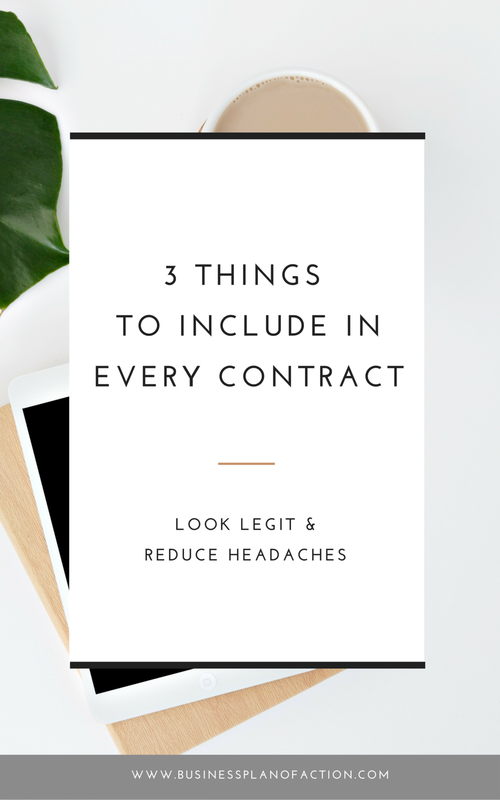 But at the risk of too much legalese and not enough brand personality, let’s look at three of the essentials that need to be in every contract with your clients. Because, we don’t want to have to address the messy legal part of business, but it’s a necessity if you want to survive in the long-term. Not technically part of your contract, but an essential nonetheless. Your clients want to know what it looks like to work together. That means you spell out what your communication looks like (will you use email, Slack, Voxer), how and when you’ll deliver information to them, whether you’ll share a Google Drive folder or a Dropbox, if there’s homework they’re responsible for and so on. You’ll also want to include your office hours and what happens when a project starts to creep outside of the original scope. Your clients are likely paying a deposit to get on your calendar and they want to know exactly what they’re going to get for that deposit--and they want to know quickly. Have this document set up as an autoresponder sent as soon as they sign the contract or pay the deposit. As a contractor, you’re being paid to do work on behalf of a client. That means that the work you do belongs to the client, not you. In most cases. If you’re using a system or process you developed to help your client and you want to retain all rights to that system, you better believe it needs to be spelled out in your contract. There are different options regarding intellectual property: all work belongs to the client, you (the contractor) own some rights while the client owns some, or you (the contractor) own the rights and assign them to the client. It’s important to know the difference between the different types of ownership, and I recommend consulting an attorney or using a contract template to spell this out for you. Sometimes scope creep happens or a new opportunity presents itself mid-contract. As long as you have this spelled out in your contract, it shouldn’t be an issue. Be sure your clients know what overcharges look like and exactly what will happen as a result. Maybe you require payment up-front or you’ll bill the client a the end of the month or all overcharges in that month. This should be in your contract and it’s important to also remind clients of these overcharges as they come up so there aren’t any surprises come billing time. Of course, a lot more belongs in your service-based contract than just what I’ve addressed here. You need to address who’s paying for what materials and subscriptions, how long the contract is in place, how to terminate the contract if necessary, what happens if there’s a dispute and so much more. Start every new client off on the right foot. Grab my How I Work Document template now!